It starts with ACE’s Network. In cooperation with Sprint, we deliver Internet access to ACE Learning Centers. ACE Learning Centers are required to use the ACE network to support their educational mission. The internet connection is used in a variety of ways – from delivering educational curriculum to the classroom or learning lab, to providing a backup system for the campus or administration, to a mobile connection when students or administration are at home or on the move. Continuing education is in our name and our charter, and we maintain our focus by championing Learning Centers that go beyond the standard curriculum taught in schools. 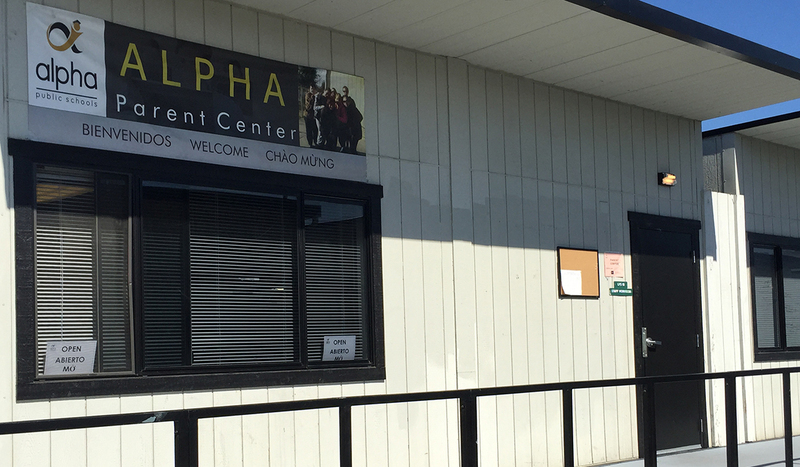 The Alpha Parent Center provides parents the space and resources needed to build a powerful community of families, a place to access stability services, opportunities to grow and become leaders, and education regarding the college admission process. Classes include English proficiency for Latino and Vietnamese parents; technology skills; high school classes for parents who want to earn their high school degree; leadership programs; how-to classes and guidance regarding the college admission process and student success; and wellness center Zumba classes. Alpha Parent Center Facebook and phone app resources provide access to check on events, student grades, housing, jobs, low-cost family counseling, free medical resources, and more. The Alpha Parent Center also acts as a coordinating organization for Second Harvest Food Bank that provides fresh food to the Alpha Schools community. Oakland International High School (OIHS) is dedicated to helping support recently arrived immigrants and their families academically, socially, and emotionally. Many students have severe interruptions in their formal educations because of war, poverty, or ethnic conflict in their home countries and, as a result, are far behind grade level in almost every subject. Continuing education is a real need for them and their families. At the ACE Learning Center, students and families are supported in their acquisition of English language and technology skills, plus success as they move to college and/or careers. These include Peralta Community College classes offered at the OIHS campus; community-based internship programs, including KDOL-TV; and Refugee Transitions classes that help parents with English, technology, gardening and cooking. The newest ACE Learning Center is in partnership with Oxford Day Academy. It supports parents and guardians of students in the community to become better supporters of their children’s education, and to understand the challenges of being a parent in the Bay Area. Currently, classes focus on advocacy for students in the school system; becoming a well-rounded parent with strong communication, boundary-setting and support skills; and support for parents of children with physical and developmental special needs through Gatepath. Gatepath is a long established 501(c)(3) nonprofit serving children, youth and adults with special needs and developmental disabilities and their families in the greater San Francisco Bay Area. San Francisco International High School is dedicated to helping support recently arrived immigrants academically, socially, and emotionally. The ACE Learning Center programs continue past work with both Acceleration and Span programs, plus a new flexible-schedule continuation education program for students across San Francisco whose work and family schedules make it difficult to attend school regularly. Acceleration is an intervention and prevention program that provides access to rigorous college-prep curriculum by giving students the reading supports they need. The college retention program is Span. It helps recent graduates through their first year of college with advocacy, administrative and cultural challenges faced by newcomer immigrants. Through peer-to-peer, group and individual advice, Span promotes college retention and academic success. ACE supports Span Fellows and Span Scholars who mentor younger students. The flexible-schedule continuing education high school is the only program in the San Francisco Unified School District that utilizes independent study, online learning, case management and small group advising to support English language learners who cannot attend high school during regular hours. Students who have to work or take care of family members now have an opportunity to earn a diploma. This is the fifth year that ACE has partnered with local San Francisco public radio station KALW 91.7 FM to offer a distinctive continuing education opportunity – KALW Audio Academy. It has grown to be a role model for journalism training in the industry. This free, nine-month intensive radio journalism training program leads participants through weekly coursework comprehensively covering all aspects of radio journalism. KALW staff and other notable media producers lead workshops on researching, reporting, interviewing, writing, voicing and sound design. Trainees learn to produce and create original feature stories and themed programs for broadcast on the award-winning nightly news and culture show Crosscurrents. Graduates have succeeded in developing popular National Public Radio blogs and shows, along with taking jobs and leadership positions in the industry where they create and tell audio stories. Many have been nominated for and/or won industry awards, while one graduate was nominated for a 2017 Academy Award in Short Subject Documentary.